Great Abs in just minutes a day! Let the AbTronic X2 do the AB work for you, so you don't have to. Electro muscle stimulation, EMS, was developed to help rehabilitate patients with muscle injuries. Now, it's being used in the fitness industry to help build the muscle you've always wanted. Perfect for all fitness levels with 8 different body workouts from short muscle contractions to long, deep pulsations. 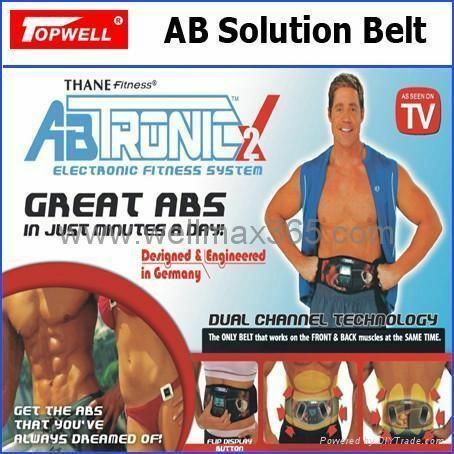 AbTronic X2 also includes 10 intensity levels. It takes only 10 minutes a day. It also tones other parts of your body - use it on your buns, your chest, your neck, shoulders and pecs. In just one minute you can get at least 400 muscle contractions. 1 - Mini Belt to use on thighs, arms, calves etc. You've seen them for $119 on TV! Don't pay that, now just $14.95!